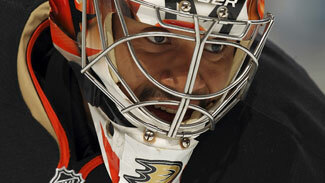 ANAHEIM, Calif. -- It appears that Ray Emery will start in goal for the Anaheim Ducks in Game 2 of their Western Conference quarterfinal series Friday. Emery was first off the ice at Anaheim's morning skate, an indication that he will make his first playoff start since Game 5 of the 2007 Stanley Cup Final -- when he was on the Ottawa side of the Ducks' title clincher, coincidentally also at Honda Center. Coach Randy Carlyle doesn't reveal his starting goaltender but he said Thursday that Emery could start "if he gets through another practice. He played last night. I would say Ray Emery is close to 100 percent." Emery is recovering from a lower-body injury suffered on April 6. He replaced Dan Ellis in the third period of Game 1 after Ellis allowed four goals in a 4-1 loss, and the last two of those were soft enough to spark speculation that Anaheim would make a change. Nashville coach Barry Trotz was prepared for either Ellis or Emery. Nashville is familiar with Ellis, a former Predator known more as a smaller, active goalie as opposed to the bigger Emery. "He really is a lot different than Dan Ellis," Trotz said. "We know that. There are things that Dan does well that Ray doesn't do quite as well. … He does it the same way, he just does it differently, and therefore they sort of get the same result. One's bigger, one's smaller. We have a good handle on Dan or Ray." Emery has become an inspiring story as he has resurrected his career following hip surgery. Originally signed as the No. 3 insurance goalie behind Jonas Hiller and former Ducks backup Curtis McElhinney, Emery fell into the starter's role and won his first six decisions. "When you go through the process of evaluating how much and how serious the injury that he's recovering from, it is quite phenomenal," Carlyle said Thursday. "That just points to the individual. He really committed a year and a half to rehabilitating himself to come back and play in the NHL. It's not an easy feat, let alone a healthy body, but to resurrect an injured body. That shows battle. That shows compete. You watch him in practice, he's on top of his game. He's still competing day in and day out." Traffic in front of Rinne: Among the adjustments Anaheim must make is disrupting Nashville goalie Pekka Rinne. "We definitely need to get bodies in front of him and direct a lot of pucks there," Ducks captain Ryan Getzlaf said. Anaheim put 28 shots on goal in Game 1 but didn't really challenge the 6-foot-5 Rinne as much as it would like. Making life difficult for Rinne has been a big topic in between games, but Rinne isn't in Anaheim's head -- yet. "Not after one game," Getzlaf said. "If we're talking after Game 4, then maybe. But you know what? We know what he can do. We know he's one of the best goalies in the League. We're trying not to get frustrated and just play our game. We've got to direct pucks to the net and just go after him." Geoffrion's debut: Two months ago Nashville rookie Blake Geoffrion was playing in the minors, but his play and production -- 6 goals in 20 regular season games -- was reason enough for Trotz use him on the fourth line in Game 1. Trotz pointed out that Geoffrion, 23, is used to high-pressure situations. Geoffrion played in the 2010 NCAA championship game for Wisconsin and in two World Junior Championships. "He's not a 19-year-old player," Trotz said. "I think he's had some good life experiences. His pedigree, the Geoffrion family. He has some good people he can listen to … he's pretty mature for a young guy." Geoffrion is the grandson of Hall of Famer Bernie "Boom Boom" Geoffrion and the great grandson of another Hall of Famer, Howie Morenz. "I always heard about how great it is to win the Cup -- obviously he (Bernie) won a bunch of those," Geoffrion said. "You start realizing how (tough) the playoffs are and how much of a challenge it is and how it is to win. It's definitely a tough thing to do, and I definitely welcome the challenge."